As an American abroad, you better have a full knowledge about IRA for US expats. Do you know IRA opportunities and tax savings you can achieve? For example, depending on your foreign income you may or may not contribute to your regular or Roth IRA as an American abroad. A lot of US expats qualify for the Foreign Earned Income Exclusion and they choose it to exclude the first $102,100 (as of the 2017 tax year). It applies to foreign wages or self-employed income from the US federal income taxes. Many people don’t know using the Foreign Earned Income Exclusion is not good. You are signing yourself to its restrictions on your contributions to an IRA. It’s important to understand the difference between Traditional IRA and Roth IRA. It helps to understand the details of correct coordination of IRAs and the Foreign Earned Income Exclusion. First of all, you need to know that as an employed American abroad, in most cases you are limited to an ability to contribute only to a traditional or ROTH IRA. If you have a foreign employer, you may not have the chance to use a 401(k) or SIMPLE IRA option as these are set up within US borders. The main difference between Traditional and Roth IRAs is when you pay income taxes on the money you put in the plans. A traditional IRA taxes you on your money in the future, when you withdraw the money in retirements. With a Roth IRA, it’s the exact opposite – you pay taxes on your funds now. Tax Tip 1: A Roth IRA may be a better option for younger US expats at the beginning of their professional career because your tax rate might be lower than in the future. Tax Tip 2: Self-employed individuals or owners of a small business have several options. You can choose to contribute to an individual IRA or set up a retirement account for your company. By having SIMPLE IRA or Self-employed Plan (SEP), you could contribute as an employee in addition to an ‘employer’ amount. Tax Tip 3: Contributing to a Traditional IRA will greatly benefit those who invest their money at the peak of their earning potential (at the highest tax rate). Why is it a good option? It is due to a tax break now since you will not pay taxes at the highest. Why choose the ROTH? If you expect higher taxes in retirement, a ROTH IRA might be best. If in future you will most likely move to higher tax rates. It means you won’t owe the IRS money when you start drawing income as withdrawals! All because ROTH IRAs are tax-free. Why choose a Traditional? Due to full- or semi-retirement, those who earn high wages expect to be in a lower tax bracket when they retire. By deducting your contributions now, you lower your current tax bill. How will your IRA withdrawals be taxed in retirement? If you are 59 ½ or older and your account is at least 5 years old, then you will be able to withdraw from a ROTH IRA tax-free. There will be taxes imposed on withdrawals from traditional IRAs. The tax rate is based on a tax bracket for the year in which you are making the withdrawal. Americans abroad may be eligible to use the Foreign Earned Income Exclusion and/or the Foreign Housing Exclusion. But before claiming any of these exclusions, you need to be aware of the effect of excluded income on IRAs. Excluding all of your income and having no other sources of earned income makes you ineligible to contribute to an IRA. You might contribute to an IRA if you only exclude part of your income or claim the Foreign Tax Credit instead. You may be able to contribute to a qualified retirement plan in cases when your income is greater than the FEIE. For ROTH IRA purposes, your adjusted gross income is modified. It adds back any FEIE and/or foreign housing exclusion that you have claimed. It leads to a really narrow range of income possibilities for US citizens living overseas to fund a ROTH IRA. For example, if you are a single filer who is claiming the full $102,100 FEIE for 2017 tax return, then you would have to earn over $102,100 and have modified AGI not more than $133,000 to be able to contribute funds to a ROTH IRA. Just like with the ROTH IRA, a taxpayer cannot contribute excluded income to a traditional IRA. What if employer’s retirement plan covers you? Then it limits or eliminates a deduction for a traditional IRA contribution completely. In latter case, you cannot participate in a group retirement plan and a traditional IRA would be available for you only on foreign wages or net self-employed income in cases of the FEIE amount. In many cases claiming Foreign Tax Credit is more beneficial and brings more advantageous results than the Foreign Earned Income Exclusion. We even have an infographic here explaining why it is better to choose FTC over FEIE. By claiming the Foreign Tax Credit, you are going to have taxable wages or net self-employment income. That will give you an opportunity to an IRA in the U.S. FTC also provides a tax reduction in the U.S. based on tax amount paid to the country where you work/reside. You do not exclude this income and have an opportunity to receive the full benefits of contributing it to an IRA. Most Americans overseas qualify for traditional or ROTH IRAs only. The main difference between these two is when you pay income taxes on the money you put in the plans. Younger US expats who are at the start of their career may benefit from choosing ROTH IRA. The traditional IRA is a better option for those Americans who are at the peak of their career. Because they invest their money at the top of their earning potential (at the highest tax rate). When you use Foreign Earned Income Exclusion and Roth IRA, it limits you to a narrow range of possibilities. Your adjusted gross income is modified to add back any foreign earned income exclusion and/or foreign housing exclusion you’ve claimed. Speaking of a traditional IRA and Foreign Earned Income Exclusion, a taxpayer cannot contribute excluded income to a traditional IRA. And a deduction for a traditional IRA contribution might be limited or eliminated completely when you are covered by employer’s retirement plan. Choosing Foreign Tax Credit can be more beneficial. You will have taxable wages and net self-employment income to contribute to an IRA in the U.S. Contact us if you want to get our US expat tax expert’s help. We offer free email consultation and will reply you within 24 hours. What if I’ve been living abroad (in Chile) since a minor? also earning less than 135.000 anualy, should I provide any tax forms or info of any kind to the IRA? . We replied to you via email. Please, check your inbox. If a US citizen is living abroad when taking an IRA withdrawal, is this considered foreign earned income and therefore untaxed up to the limit of the FEIE? IRA withdrawal is not considered to be an earned income. If a US citizen living abroad takes an IRA distribution and has no earned income, only SS payments into a US bank account, do we owe income tax on the distribution. Early IRA distributions are taxable. Your withdrawals from a Roth IRA are tax-free as long as you are 59 ½ or older and your account is at least five years old. Withdrawals from traditional IRAs are taxed as regular income, based on your tax bracket for the year in which you make the withdrawal. While applying for a traditional IRA, my bank list employer address as Domestic, Canada or military.. my employer is a foreign entity. Does that mean I can’t apply? No, it doesn’t mean you can’t apply. Please, speak to your bank directly about it. Thanks! Im a US citizen living and working outside of the US. I would like to open up an IRA Roth online with tdameritrade for example. Can I do this? US citizens abroad can have IRAs, but banks can close them at their discretion. The issue lies with the financial institution. I l’m a US citizen living in New Zealand permanently. I have a US source earned income. Can you name US institutions that will be willing to open an IRA account for me?Thanks. Unfortunately, we can’t name US institutions that will open an IRA account for you as it depends on the institution itself on a case-by-case basis. In the case of a US citizen working and living abroad and the foreign employer provides with a foreign pension scheme. Would the taxpayer be considered as “covered by a retirement plan” for purposes of the IRA qualification? if so, Would this only apply if the foreign pension is accepted by the US? or if the foreign pension scheme is to be treated as a PFIC then the taxpayer would not be considered as “covered by…”? A foreign pension plan has no bearing on qualifying for an IRA. Canadian pension plans are covered by the tax treaty and as such, investments within it will not be PFIC. Same question ( and so glad I stumbled on this link) , I am also covered by a foreign pension plan. Is it safe to conclude that this is not the retirement plan exclusion mentioned by IRS? As married filing separately, am i understanding correctly that the income limit for me is an adjusted agi that is actually my full income, no FEIC ? Regardless of having portion of income earned inside the US? And this has to be less than 10k for a roth IRA? Foreign pension plans don’t impact your eligibility for an IRA. You would need to use Foreign Tax Credit in order to qualify. If you use Foreign Earned Income Exclusion, you can’t contribute to an IRA. If I understand correctly, we should exclude foreign income where appropriate, but then refactor it into our overall annual income figure for the purpose of determining if our individual MAGI and therefore if we qualify to contribute to a IRA. Am I confusing something? It used to be $5,000, indexed in inflation. $3,000 must have been a long time ago. You can only contribute the amount that was not excluded by the FEIE. i opened up a roboadviser account and contributed to a Roth IRA through this roboadviser while working abroad … my mom’s accountant did my taxes, but I didn’t pay taxes last few years so guess I did the exclusion…I didn’t know that there were restrictions on ira until a friend mentioned it recently… could I get in trouble for the contributions I made over the last couple years? Any way to fix it? Thanks! You filed the return in good faith and don’t need to do anything, but going forward the foreign tax credit would be the answer. Inherited IRAs are not subject to earned income requirement and as such, you can open an Inherited IRA account while still claiming the FEIE. Hello, I am a U.S citizen and a citizen from Spain with a Roth IRA . I am moving to Spain.for work and maybe to retire there. Can I keep making contributions to my Roth? Yes, you can keep on making contributions to your Roth IRA if you use the foreign tax credit (as opposed to the foreign earned income exclusion). Given the tax rate in Spain, I believe that you can eliminate your US tax liability using the foreign tax credit. Me and my wife were non resident aliens for previous year in US. I have earned income (wages) for that year. Am I able to contribute to Roth IRA? What are the limits? Same limits apply to everyone. The contribution limit was $5,500 in 2018. Are there any brokerages left in the US that allow non-residents to maintain IRAs without a US address? I don’t think so. For the last half of 2018 I opened up and contributed to a Roth IRA before discovering that there is not much benefit to me as I am an expat living in South Korea and have been claiming the FEIE for the last few years. I’ve only made contributions and haven’t done anything else with the money in my Roth IRA. I have a couple of questions. 1. If I withdraw the contributions now or try to roll them into a taxable brokerage account, would I be able to still claim the FEIE for 2018 tax year? 2. If I cannot claim the FEIE and must claim the FTC due to the contributions I made, going forward would I still have to claim the FTC even if I do not further contribute to the Roth IRA account? I’ll be in South Korea for another year and plan to move to Europe after, so I would like to know what my best options would be. Thanks! I am US and Swedish citizen living in Sweden for almost seven years with a regular IRA(rolled over from a 401K in 2012) at an US institution. I am older then 59 1/2 years. Tax treaty in effect which I believe means the pension income such as IRA withdrawals is to be picked up in the country of residence which is Sweden. Are there any limits as to how much of the IRA I can withdraw in once sweep(the exchange rate Is currently extremely favorable)? Is there anything else I need to consider? The only thing that you are missing is the savings clause of the tax treaty. The treaty benefit you are describing might not be available for US citizens. Other than that, you are correct. Hello. I am a US citizen working abroad. I have a now question and a future question. Currently I have a ROTH IRA and want to continue to contribute to it. Can I split my income with the FEIE? Like take the minimum I would need as US salary to contribute to my ROTH and then exclude the rest? For the future: The tax rate where I currently live for me is about 30%. But I am not required to begin paying this until after third year of residency and currently I am just beginning my second year. When that time comes will the FTC be most beneficial? My tax bracket in the US would be around 19% I believe. So if I take the FTC and pay at 30% abroad versus 19% in the US what happens? 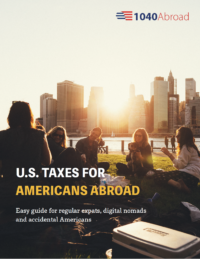 I am a US citizen living abroad and wanted to confirm if IRA distributions are considered worldwide income that needs to be reported in the country outside the US for tax purposes. They would be sourced in the US i.e. taxed in the US. I understand that part but trying to figure out if the country of residence outside the US would consider this type of distribution to be worldwide income and taxable. If so, it seems like both countries tax returns need to be calculated at the same time to use tax paid amounts and credits to offset for the other county. I do my own taxes but this adds another level or two of difficulty;-! my spouse works overseas this year, and he paid high tax in another country(35%-40%). We are filing joint. I have university retirement play, 403b(before tax, after tax) and 457(pretax and roth). So I think I should contribute to after tax since we will use foreign tax credit which should already higher than US. Is that right? you are right. If you need help, feel free to book a call or email consultation with us at 1040abroad.com/contact. Can costs of repairing/improving a house in fla for the express purpose of selling it for relocation to peru……. are these be deductible? I have purchase property in Tarapoto peru and plan on building a house on it. I plan on transferring my assets from Vangard to 401k type accounts in peru where I can draw on the interest to augment my monthly SSN income. And yes I plan on retiring there….. without any type in business income..at least that that can be reported to the IRS I may start a “art studio” for a hobby/ business loss. I have read 4 books on this type of subject but yours “us taxes for worldly americans” made the most sense ; thou I will be honest there were parts that made my head hurt…. a. can i continue to contribute to my roth ira? b. what are the tax implications when i decide to withdraw the money given my status? I am working overseas for a US company and chose FEIE since I did not know about FTC and its impact on IRAs. I am contributing to my company’s pre-tax 401k plan but they also have a ROTH (after tax) 401k plan. My entire income falls well under the 103,000 FEIE limit. Does this mean I am unable to contribute to the ROTH 401k plan my company is providing (since i am not in between 103k – 133k) or that if I did contribute that I would be liable for some taxes? You would be subject to penalties if you were to contribute to a Roth IRA while ineligible. Could you please provide the official IRS links to prove all of this information is true? I’ve tried searching, and from what I’ve seen it feels like most of this contribution ineligibility has been word of mouth.